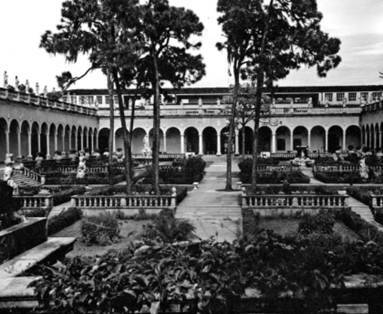 Established in 1927 and governed since 2000 by Florida State University, the Ringling Museum is one of the largest university museum complexes in the United States. The complex, featuring an art museum, John and Mable’s historic mansion, historic theater, research library and conservation laboratory is a tribute to John Ringling and his legacy. The colorful history and artifacts along with the breathtaking 66-acre Bayfront Gardens makes this a destination for all ages. Such an important landmark in our nation’s history must be carefully maintained to preserve its beauty for generations to come. Routinely cleaning the Sanitary Sewer Pipes is an important part of this, to ensure the system is open and flowing as well as to inspect the pipes for any current or potential failures using a Sewer Camera. Blueworks Cleared, De-Silted, Cleaned and Video Inspected the Plumbing Pipes servicing the Circus Museum, Tibbals Center & Banyon Tree Restaurant, the Searing Building, the Art Museum, the Education Building as well as the Ca’D Zan. The Plumbing Pipes were serviced with a combination of morning, day and evening work, depending on the best interests of the property and patrons. Section by section, the Main Plumbing Pipes and Lateral Servicing Pipes were Cleaned and returned to proper operating condition. Debris was removed from the system to prevent future back-ups or blockages, saving the property from system overflow damage, inside & out. Cleaning the Plumbing Pipes on your property when the structural integrity has not been compromised can be just the thing to extend the life to your Sewer System. Inspection the Pipes using a Sewer Camera is a proactive way of detecting a problem before it surfaces.